A collaborative project by artists Ellie Irons and Dan Phiffer, Neversink Transmissions was both a public sculpture and a web archive sited in the town of Denning, New York, from July 2011 through March 2012. 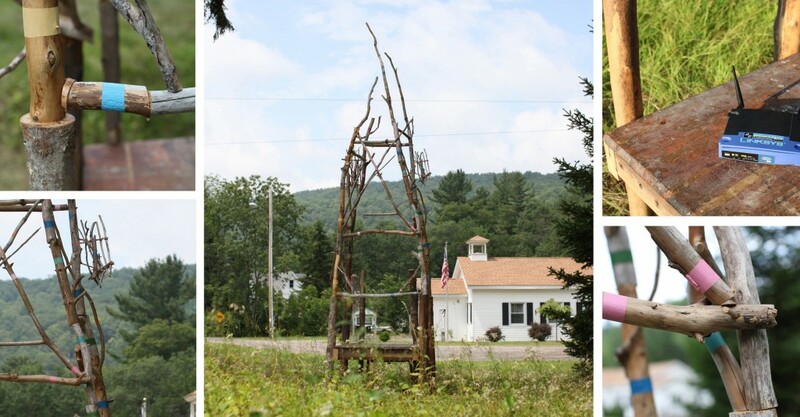 Installed along the Neversink River in the Catskills region of upstate New York and supported by the EPA and the Wildcat Fellowship, it included a faux cell tower built of driftwood, and an archive of interviews about stream ecology in this shifting rural landscape. Through wifi and pirate radio the tower provided a gathering place near Town Hall and a source of locally generated knowledge, including audio interviews and photographs, about ecology and culture surrounding the Neversink River in a region with out cell phone service or broadband internet. More about the process is available on the Wildcat Fellowship Blog and the interview archive is here.